4x8 piezo horn tweeter. These are light weight and easy on the back. A lot of wedding bands pick these up as well. 2-way 10" pro audio speaker with 40 oz magnet and 2" voice coil. SPEAKER CABLES. PA SPEAKERS. (1) Peavey PV 15PM 15" 200 Watt Class D Bi-amplified. The Peavey PV 15PM is a two-way powered monitor system engineered with a bi-amplified class D power section that drives a 15" woofer with a 2 3/8" voice coil and a 1.4" titanium diaphragm 14T™ compression driver with 200 watts total power. 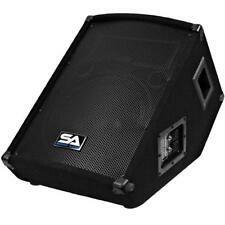 USED:(2)Two Seismic Audio SA-10M.2 Floor Monitor Studio/Stage PA/DJ Speaker. 4" x 8" piezo horn tweeter. 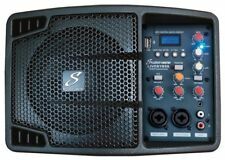 UsedSeismic Audio SA-10M.2 speaker, These monitors are great for vocals, PA systems, small DJ gigs, weddings, churches, and sound monitors. These can be used on any setup for full band or drum monitors. The Nady FWA-15 Powered Floor Monitor has a 5" x 15" compression piezo horn for sparkling high-end. 3 channel inputs include XLR and 1/4" mic level, balanced XLR and 1/4" line level, plus balanced XLR and dual RCA line level. 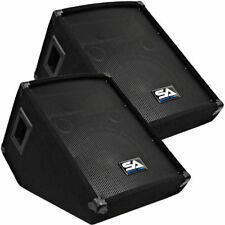 PRICE IS FOR (2) NEW PEAVEY PV15PM 15" CLASS D POWERED FLOOR MONITORS. The Peavey PV 15PM is a two-way powered monitor system engineered with a bi-amplified class D power section that drives a 15" woofer with a 2 3/8" voice coil and a 1.4" titanium diaphragm 14T™ compression driver with 200 watts total power. 150 Watts RMS - 300 Watts Peak. These monitors are great for vocals, PA systems, DJ gigs, weddings, churches, and sound monitors. These can be used on any setup for full band or drum monitors. 12" Speaker Monitor. 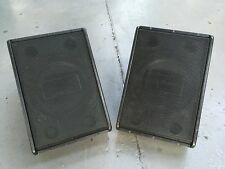 (1) Peavey PV 15PM 15" 200 Watt Bi-Amplified 2-Way Powered Floor Monitors. The Peavey PV 15PM is a two-way powered monitor system engineered with a bi-amplified class D power section that drives a 15" woofer with a 2 3/8" voice coil and a 1.4" titanium diaphragm 14T™ compression driver with 200 watts total power. For nearly four decades, the Hot Spot series has evolved. The HS4 brings back the classic style, look and feel to the Hot Spot line while retaining optimized vocal clarity. The HS4 is lightweight, easy to setup, and has a small footprint allowing versatility. Since 1969, the Hot Spot series has evolved. The HS4 brings back the classic style, look and feel to the Hot Spot line while retaining optimized vocal clarity. The HS4 is lightweight, easy to setup, and has a small footprint allowing versatility. Galaxy Audio Live Sound Monitor 12X16X17 HS4. For nearly four decades, the Hot Spot series has evolved. The HS4 brings back the classic style, look and feel to the Hot Spot line while retaining optimized vocal clarity. (doesn’t need a power amp) Very powerful and solid sound, think it’s about 150 watt. In good working order, the odd mark from use. But it work and performs very well. Collection by a 3rd party will be refused. Conditions of sale Nominal impedance: 8Ω. The lightweight LIVESYS5 unit also includes a ultra low noise 3 channel mixer that is perfectly combined with a 3 band EQ and multiple build in effects. With the two versatile mic channels and one line channel allow the user to input anything from vocals, guitars to keyboards, making this 150 watt unit the ideal monitor speaker. CONNECTORS; TWO NEUTRIK SPEAKON IN PARALLEL. AND TWO 1 / 4" PHONE JACKS IN PARALLEL. WE HAVE THE FULL TECHNICAL SPECIFICATIONS AS SUPPLIED BY COMMUNITY. POWER 200W RMS - 500W PROGRAM. TWO 12" WOOFERS, FERROFLUID COOLED. PAX10 10” ACTIVE MONITOR SPEAKER. The PAX10 features balanced Jack input & a link output to allow multiple PAX monitors to be connected from one signal source allowing the whole band to hear. HF unit High frequency tweeter. STUDIOMASTER PAX12 – 12″, 120W Active / Powered. The cabinet is angled perfectly, so you can really hear it! A strong steel grille keep your speakers safe. To help solve this problem the PAX12 is fitted with a high quality, variable notch filter. Stage Monitor / PA speaker, passive. High power handling combined with tough build quality make these excellent value for money. Large carry handles. As soon as we have received the item back it will be checked to confirm the fault. However our product range doesn’t end there! Pulse PVS12 Wedge Monitor Foldback Speaker PA System Sound System Band 300W 12"
Pulse PVS12 Wedge Monitor Foldback Speaker. Piezo Tweeter Size: 8"x12". High power handling combined with tough build quality make these excellent value for money. Frequency response: 40Hz-20kHz. Output power (RMS/Peak): 150W/300W. SPEAKER ACTIVE LANEY CXP-112 12"
ACTIVE SPEAKER LANEY CXP-112 12 '. MPN Non applicabile. Phonic SEM712 150w RMS Stage Wedge. Condition is Used. Works well only 1 speaker jack input works other damaged no parts to fix 12 inch speaker wedge Few marks on cabinet enclosure but working order.